Title: CP 8834, 8835, 8836 Brand new, first day on the job. Description: CP 8836 waits to head out from Kanier Yard in Hamilton Ontario 01/27/07. Description: A single GEVO brings a train into Shoreham on the East Main. Description: CP 8836, with an autorack train, goes by Hohman Tower. Description: Sohl Avenue that is. That's where CP 8836 prepares to cross. Description: This was taken from BRC's 65th Street grade crossing. I'm actually standing in Chicago but who cares. Description: Here comes the CP train from earlier. This shot was taken looking southwest from 68th Street. Toyota Park is the home of MLS Chicago Fire soccer and several concerts coming up. Description: Four GE's lead an eastbound at Murray Siding. Description: An eastbound accelerates out of Glenwood past the CA ammonia terminal. 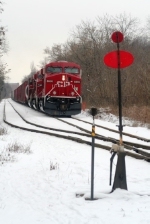 Description: CP ES44AC 9936 leads a westbound manifest through the Dells. Description: A shot I've been meaning to get for a long time, but its only possible in the summer, and ofcourse you need to get a train at the right time. Today 498 rolls across the SOO's Mississippi River bridge with the Minneapolis skyline in the distance. 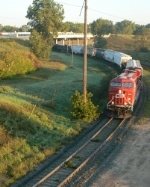 Description: CP train #199 departs La Crosse. Title: CP 8836 CP's Tomah Sub. Description: CP Train 660. A cold Winter Morning. Description: Hard to see, but the 2nd unit's red; eastbound CSX freight at Locust has CP Rail gevo for support. Description: Woman reviews her great luck on happening upon a foreign unit at Locust in Philly. Description: After receiving a new crew, Canadian Pacific train 253 makes her way north towards St. Luc Yard in Montreal with a pair of GEVOs, manifest traffic and a handful of intermodal.